How do you find a good teacher? This is a very tricky question for anybody starting out with horses- how to find a good professional to learn from. In fact finding a good professional in any equestrian field is exceeding challenging – evaluating a farrier, dentist or chiropractor is likewise a very tricky problem – but I’m going to focus on teaching for now and perhaps try to touch on some general rules that can be applied in other cases. When you are first looking to learn to ride or to learn how to improve the connection between you and your horse the real problem you will run into is that of what Donald Rumsfeld famously called “Unknown unknowns” – the things that you don’t know that you don’t know. Until you have learned enough to evaluate how a trainer keeps, rides and handles their horses, it is very hard to be sure that they are a good person to ride with. So how can you judge? I don’t have a definitive answer, but the starting point is to decide what you want. Do you want to learn the basics of how to ride, how to handle and understand horses or to improve in a particular discipline? A lot of people who teach will tend to specialise in one or another of these areas rather than covering all of them. Dressage is more or less universal- the basics of Dressage are the foundation for all types of riding – but a competetive Dressage instructor may not necessarily be the best person to begin learning with. I am of the opinion that you can’t learn very much that is useful in terms of riding or horsemanship technique from a book until you are already working at a fairly advanced level, but what you can learn from watching and reading is what a horse looks like when they are working correctly and happily. If you want to identify a horse working correctly you could take a look at the work of people like Gerd Heuschmann and Dr Deb Bennett. There are some fairly clear biomechanical principles involved in a horse carrying a rider and they are something you can learn about and learn to see in people’s riding. In terms of identifying if a horse is happy in their work, there can be a lot of differences in opinion regarding that, but I look for an appearance of softness and physical relaxation combined with attentiveness to the rider’s cues. Ross Jacobs writes a lot about this on his blog, often posting video clips of what he considers to be particularly good or bad examples. Spending some time to learn about both of these things will be very useful when you want to evaluate potential teachers. When it comes to actually finding someone, recommendation is a good starting point, especially from people you know whose riding you admire. Not everyone has lessons, of course, but people with experience will often know which instructors they rate even if they aren’t currently learning. If you don’t feel anyone around you exemplifies the way you want to ride then you might choose to look for people who come from a particular approach that is interesting to you- there are various organisations dedicated to teaching riding and horsemanship around and most of them have some very good instructors, although very few have only good instructors. If there isn’t anyone in your area, you could always ask the nearest person you can find anyway- sometimes people are willing to travel or are travelling anyway, other times they may be able to recommend someone closer to you. I'm lucky enough to have one of the best riding instructors around not too far from where I live. When you have identified a potential instructor, the next thing to do is to make sure they are a good teacher for you and will be able to teach you what you want to learn. That might seem a little obvious, but not every teacher suits every student. You may be able to judge that just from a phone call, but most teachers should be happy for you to watch a lesson if you want to so you can decide for yourself what you think of their way of working. If you are happy with how the horses they are teaching with respond to them and that they are teaching what you want to learn then you’ve found yourself a great opportunity. If not, you haven’t wasted their time or yours on lessons that don’t suit you. If you are starting to learn to ride, nothing will be better for you than lunge lessons. Find an instructor that can offer them. A good teacher can always explain what they are doing and why. Never be afraid to ask if there is something you don’t understand and to keep asking until you do understand- that is what you are paying them for. If you are riding your own horse and an instructor suggests that you do something that you are not happy with don’t be afraid to say no. It is your horse, and your lesson. A good instructor should be able to explain why they they are suggesting what they suggest and if you are not happy with it just ask whether there is another way that you could get that result. 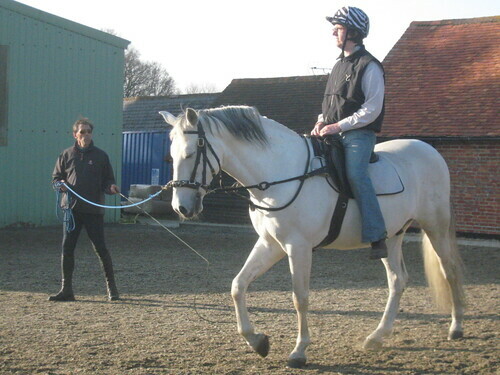 In the UK there are two main riding instructor qualification organisations, the BHS and the ABRS. The structure of their examinations and the approach they take to teaching means that in my opinion an ABRS qualified instructor will have a more solid grounding, although there are fewer of them. If you are in doubt about anything, just ask. You are there to learn and anyone interested in teaching is always much happier to be bombarded with questions than to be left wondering whether their student is understanding what they are trying to teach. Every lesson should show some kind of clear improvement. If you are continuing to have lessons but you don’t feel that you are improving then at the very least you need to talk with your instructor about that. Sometimes this is a mark of you having outgrown what someone can teach you or needing to take a break and just let it soak in a little. Other times you might just need your instructor to change their strategy a little. Of course ( ahem ) if you’re interested in learning about horsemanship and developing softness, lightness and communication, and you’re based here in the South East, it would be remiss of me not to point out that I have a contact page. I may not be a professional but I have spent a lot of time working on this and I have learned enough that I can usefully share. This entry was posted in learning, people, teaching and tagged learning. Bookmark the permalink. You must be logged in to post a comment- you can log in using Facebook, Twitter or any OpenId provider.